It soon became clear that like many conventions, the social aspect of old friends meeting up again was an important part of the event. The Ozzies and Kiwis are a friendly bunch, despite the impressions to outsiders that could be created by the ‘friendly’ banter related to rugby. I’m used to it after years of living in the UK. I soon found myself chatting with more people than I can remember. I blame my age for not remembering every person who made me feel welcome. Fortunately the delegate’s registration pack included a full list of those who had made reservations, very useful when you get Facebook requests to remain in contact. I’m not a great user of Facebook, so don ‘t expect a daily updates and lots of activity. By noon we were all invited to get on 2 buses for a Magical Mystery Tour (well, it was for me!) to collections, first to Stan & Jane Walkley at Plantation 2000, offering wholesale palms and cycads. But there was so much more to see, this time captured on digital images. Clearly the climatic conditions in Queensland are quite different to those in the UK. 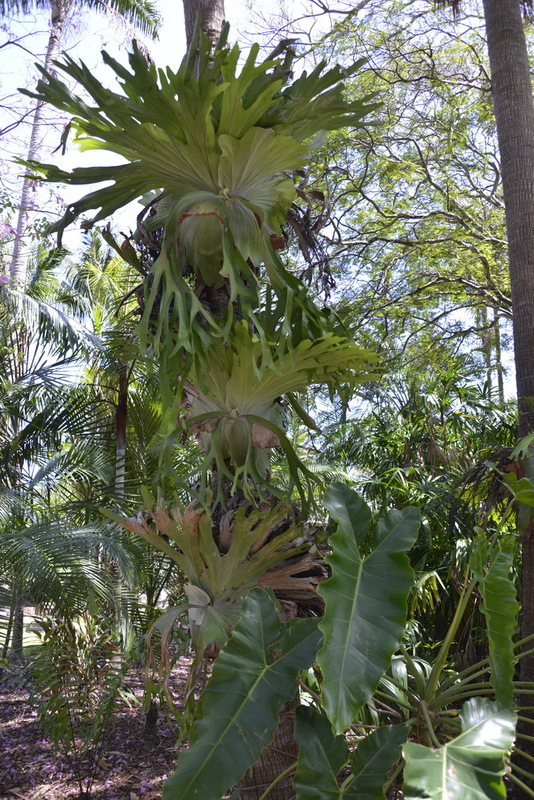 Along the entrance path there were endemic orchids and staghorn ferns (Platycerium). I first saw a Staghorn fern in the living room of an auntie in Den Haag. It was an old venerable plant and uncle and auntie impressed on me that these required a lot more care and attention than the cacti that I was showing a keen interest in. Centrally heated houses are not the best location for these magnificent plants. Using Google, I learned that there are some 18 species that are found in nature in South America, Africa, Southeast Asia, Australia and New Guinea. This was the first time I had seen them growing (cultivated) outside, mounted on trees. Just as well that I took up growing cacti – these plants can grow to a significant size, several meters in diameter! At the nursery there were ‘cages’ made of a large mesh panels, such as used for fencing, positioned in the shade of trees, bedecked with Tillandsia. I had already noted that Bromeliads were to be found in large numbers in the collections of C&S hobbyists. In fact, the local C&S at first covered Bromeliads as well until a growing membership was able to support two separate organisations. The other plants that impressed were the huge pachycaul trees – plants that in the UK are hard to obtain – I bought my few plants from Exotica, the nursery in Germany run by Ernst and Martina Specks. I had only seen plants of the sizes seen here from images taken by friends in the field. Talking of large plants, when I took several steps back I found that I had been standing in the shade of a Bunya Pine (Araucaria bidwillii). Its size made it tricky to take its picture, but I have at least one that I could use along Araucaria araucana (the Monkey Puzzle Tree) seen in Patagonia on both the Chilean and Argentinean side of the border and of Araucaria angustifolia, seen in Rio Grande do Sul in southern Brasil. There are 19 species all from the southern hemisphere, that originally date back to the days that the Southern continent were joined together. Large Cycads and mature Melocacti were among the other impressive range of plants offered for sale. Several boxes of plants found their way back on the coach. But first we enjoyed a welcome buffet lunch and an opportunity to take on water – boy, it had grown warm! And so the Magical Mystery Tour moved on to the collection of Lou & Tish Randall for afternoon tea. Here, most of the plants already seen at Plantation 2000 were seen planted out in a large landscaped garden. Clearly the amount of time, energy and resources that people put into the hobby knows no limits. 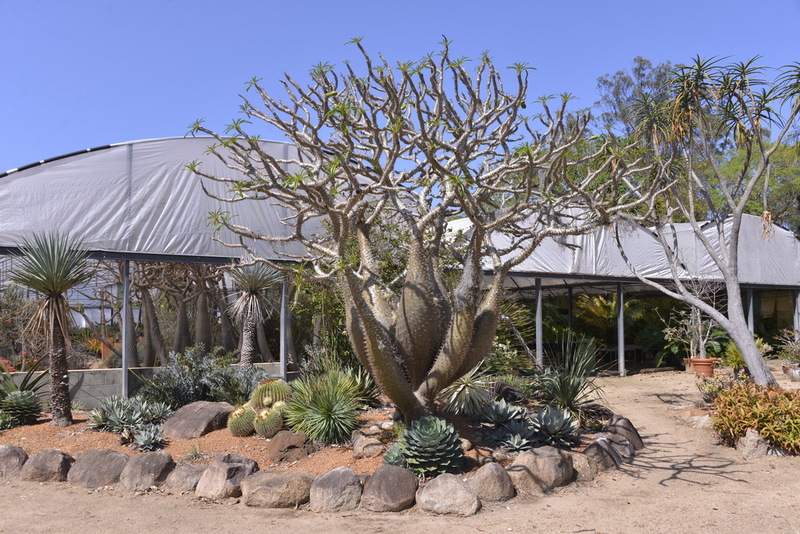 Clearly the Queensland climate around Brisbane is not dissimilar to that of Madagascar as huge specimen of the Didiereaceae and Madagascan Pachypodium showed. A generous afternoon tree made sure that we did not get hungry. Tensions were building after seeing so many plants and there was a bit of a feeding frenzy when back at the Convention Center the plant sales opened. How frustrating that I was not able to take any plants back to the UK, without probably a huge amount of paper work and administrative costs. Good job there was a book sale as well, with offers from Attila Kapitany and Kim (Holbrook?). I bought a book on the cacti of Texas and chatting with Ernst van Jaarsveld , ensured that one of the four Welwitschia books that he brought to Australia would come home with me to the UK. The biggest surprise was meeting Pablo Weisser, now living in Australia. Pablo is a Chilean who would make expeditions with Hans Lembcke in the Atacama Desert to collect seed for Friedrich Ritter that would be sold in Europe through his sister’s, Hilda Winter, seedlists during the late 1950s and early 60s. 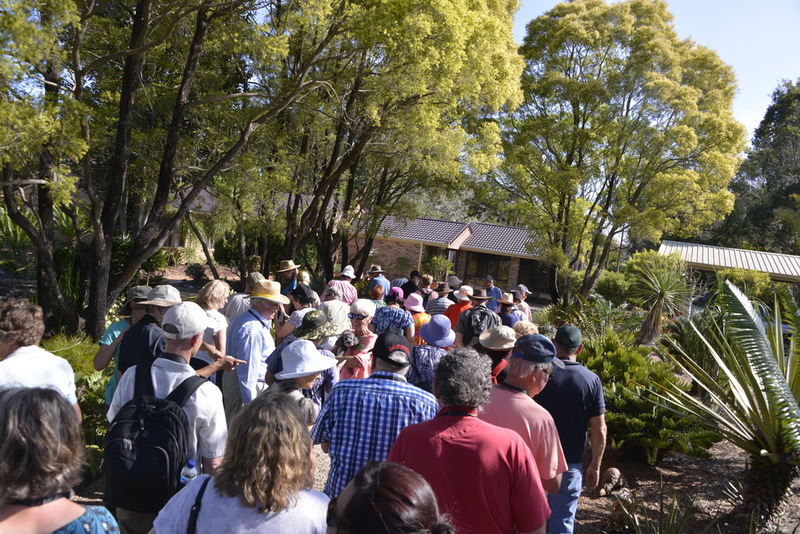 Cactophiles who specialise in South American cacti hold Ritter and the plants he described in high regard. There is a Thelocephala weisseri that I have photographed in nature, but that these days seems to be ‘lost’ as a synonym in the Eriosyce odieri complex. Pablo provides an interesting insight to the history of Chilean cacti from the ‘Ritter days’ and it would be great to travel with him in the country of his birth and to learn of past adventures – we have it so easy these days in 4×4 cars on tarmac roads.